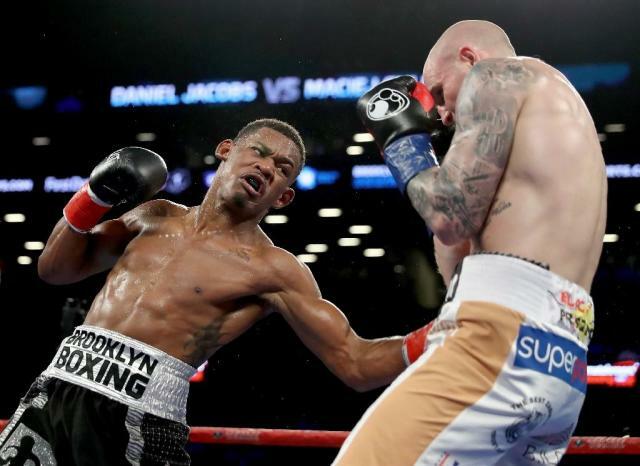 Former boxing middleweight world champion Daniel Jacobs (L) - here punching Maciej Sulecki of Poland - is a cancer survivor nicknamed "Miracle Man"
New York (AFP) - Former world champion Daniel Jacobs fights Sergiy Derevyanchenko for the vacant International Boxing Federation middleweight world title Saturday with one eye on Saul "Canelo" Alvarez. Jacobs, 34-2 with 29 knockouts, will be out to impress against the Ukrainian, who is unbeaten in 12 professional fights with 10 wins inside the distance. "I feel like I'm the strongest middleweight that he has stepped in the ring with professionally," said Jacobs, a cancer survivor nicknamed "Miracle Man". His career almost ended in 2011 because of osteosarcoma, a rare form of bone cancer. He made a full recovery but spent 19 months out of the sport while battling and recovering from cancer. "I feel like that I have the advantages when it comes to the mental aspect of the experience of knowing I can go full 12 solid rounds with the best of them and compete at an all-time high level," Jacobs said. "I mean, I know that. I have it in my bank, I have it in the gas tank already. "A guy that's inexperienced with only 12 fights, I would presume that it would be a second guess on his behalf." The bout brings Jacobs back to Madison Square Garden, where he lost a decision to Gennady Golovkin in a middleweight title tilt in March of 2017 but became the first fighter to take Golovkin the distance. With a win on Saturday the 31-year-old can regain a 160-pound belt and move closer to a bout with Alvarez next year. Alvarez hasn't spoken about who he might face in a May 2019 bout, but promoter Oscar De La Hoya has mentioned Jacobs, Callum Smith and Jermall Charlo as possible foes. The bout is on the last scheduled boxing card backed by US cable network HBO, which announced in September that it was walking away from live fight programming after 45 years. On the undercard Puerto Rico's unbeaten knockout artist Alberto Machado defends his World Boxing Association "regular" super middleweight world title against Yuandale Evans. Machado, 20-0 with 16 knockouts, holds the WBA belt one rung below the "super" world champion title held by Gervonta Davis.